Following the enormous success of “Dad’s Army” last season, we are thrilled to have been given special permission, by the writers, to present the stage version of this very successful and long-running TV series. 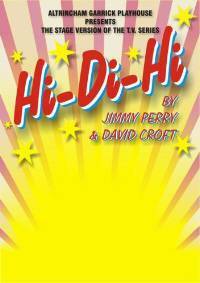 Come back with us to the late 50s/early 60s and enjoy once again all the simple humour of a bygone age. With the words “Hello, Campers” ringing in your ears meet again Gladys Pugh, Jeffrey Fairbrother, Ted Bovis and of course Spike and Peggy and others. Relive a time when Yellow Coats, Chalets with bunk beds, canteen type meals and talent shows were the order of the day. All the characters are here waiting to entertain you and after the “Dad’s Army” sell out don’t leave it too late to order your tickets for this one.